“The release of Davis in my opinion is just a green light for more killings and assassinations by the US government and the CIA in your country. The pillage and slaughter of Pakistani will increase most likely in the quest of the US for imperial power over your country and region. The question of justice has been replaced by money. This is the typical way the US works, kill and buy people off. Talkhaba: Since you have been undercover CIA official during Vietnam War, you were a witness to the events during an important part of history. How do you relate the history . . . the working of covert agents of your time to present CIA espionage tactics? Robert: I tried to paint in my article a picture of the scope of how this is done by various agencies of the US government. I was not an official of the CIA but a regular military man put on loan to the CIA for covert work. It is extensive and way beyond my scope to detail. It involves thousands and thousands of people. There is a lot of literature around on this by others too, especially some ex-CIA agents and people like John Perkins. Talkhaba: You are the Raymond Davis of the past; your period extends over years. What sorts of tactics were adopted during that period? Were these upgraded with time? If yes, then would you share some details with us? Robert: You could read up on the Phoenix Program and COINTEL programs and get a good idea of what went on in the 60s. Read of the murder of Fred Hampton, for instance. Ward Churchill has some good books on this too as it relates to Native Americans. I would imagine the tactics have changed some but still also rather simple, assassinations where bribery and threats do not work. The torture of Pvt. Bradley Manning by our military is a good example. Talkhaba: According to your knowledge how many undercover agents were working in Vietnam? How many agents may be working in Pakistan? Robert: In Laos and other areas, the reports are: a large number. I have no idea as there is a fuzzy line between the official military people and the covert forces. They are all out for the same goal, to destabilize and corrupt and overthrow governments. Sometimes it is done directly with the military sometimes it is done with covert acts. You must know well the coup in Iran in 1953 by the CIA. That is the model that all the rest of this flows from. No idea of how many of them must be there in Pakistan but I would think the number is quite big given the key position Pakistan occupies in the U.S. plan for the conquest of Eurasia. Talkhaba: John Perkin has informed his readers of a special tactic. According to him, they had been using women as a blackmailing tool as well as a source of top secret information. Are similar tactics being used by CIA and FBI? How do you see the use of this tactic in Pakistan? Robert: I have no such information on the ground knowledge of events in Pakistan but it would not surprise me if this tactic was being used there too. Talkhaba: How do you see American demand for blanket immunity for Raymond Davis, the CIA operative and killer of two Pakistanis? Robert: Typical. Deny; cry that he is a victim of the folks who don’t understand the greatness and goodness of US intentions. Just some people don’t get the word they say. It is entirely up to Pakistan to decide what to do. Talkhaba: Given the capability of Tehreek-e-Taliban, Pakistan, some defense analysts assert that terrorist attacks in Pakistan can’t be carried out by Taliban; instead these are planned and perpetrated by CIA? In the light of your experience in Laos, can you endorse and substantiate this assertion? Robert: It is possible but I don’t know any details. This is done a lot; it is called False Flag operations. The CIA has had plans to kill Americans to get its plans going here too. Talkhaba: John Perkin in his book “The Secret History of the American Empire” has exposed the World Bank and other monitory organizations as tools of American Imperialism. Do you think CIA, FBI and US secret agencies are working for the same cause on other fronts? Robert: Of course. They all think the US has a manifest destiny to rule the world, or as some say it, to be the world’s policeman. But what they are after are the resources of other nations. Talkhaba: Blackwater/Xe Worldwide has been working as CIA’s operative in Iraq, Afghanistan and Pakistan. Prior to the advent of these mercenaries, CIA had been doing all this work by itself. What made CIA to out source its work to various operatives like Xe? Are these operatives crueler up to the requirements? Robert: I suppose to try to hide it from the American and other people. But anyone with awareness knows what is going on. Talkhaba: CIA has its network in nearly all countries. Are they freely working in all countries alike or, unlike Pakistan, it will be difficult for it to work in the countries having severe relationship with US or relationship based on the principle of equality and respect for each other’s sovereignty? Robert: From what I can tell they do this to everyone, friend and foe alike. Talkhaba: How do you see the America’s “War on Terror”? How far is it tarnishing the very image and interest of USA inside and outside? Robert: It is corrupting our political system from top to bottom. Talkhaba: Your article published in “Counterpunch” gives the impression that American masses remain ignorant of truth. It’s also believed worldwide that Americans top the list of nations blindly following their rulers. Has your educational system any relevance with this phenomenon or some other causes compose this highly “educated” blind nation? Robert: Patriotism and religious self-righteousness is what blinds many people here. The educational system is not teaching the truth, mostly myths and lies. Talkhaba: What is your experience says about 9/11 tragedy. Do you believe it was done by some Muslim Groups? What is our assessment of Al-Quaida and Taliban? Robert: Seems to be. They don’t like U.S. intervention in their countries. Talkhaba: Can you give some advice to Pakistan how to get rid of current terrorism? Robert: More education of the public and help in understanding that the U.S. can be as terroristic, and a problem, as any other group. Stand up strong and don’t let things like Ray Davis go away. Talkhaba: Is there anything which I haven’t asked and you want to share with our readers? Robert: No, you have done well. Keep working for truth and justice. Drone Hitting Test by PAK ARMY: A Demonstration of Capability or Helplessness? This NEWS by SAMA TV hasn’t come as a good news to Pakistanis, instead this speaks volume of our helplessness rather brazenness. If you don’t agree with my words then tell me you have top class guns and the murderers are killing your kids but you just point those guns towards a testing range demonstrating you are well equipped. What should be called to that act? Le me keep my tongue closed as I have nothing less than dirty abusing words for that act. The headline of News Reads, “Pakistan air defense capable to hit drone”. I ask what does prevent our “capable” armies from hitting US drones which have killed few “extremists” and hundreds of citizens of Pakistan. Or the inhabitants of FATA aren’t the citizen of Pakistan? MULTAN: Pakistan Army tested its air defense system by hitting the drone on Monday. Pakistan Army tested its air defense to hit the drone in Muzaffargarh Khudai range. Pakistan Army’s air defense hit three drones successfully. Lieutenant General Ashraf Saleem said that Pakistan air defense is capable to hit the drone and all other fighter aircraft. He also added that Pakistan has advance and modern air defense system and Pakistan’s air defense system is capable to defend the air space of the country. This is exactly the message which the Pakistani Army actually wants to publicize. In fact our army wants us believe that it’s not their fault if unchecked and no-stop drones “visits” us so often. It is the political leadership which has failed to shows its love for sovereignty and integrity of this strange peace of land called Pakistan and is unable to protect its citizens from the evil devil and savage United State of America which has been successful in converting its Afghan War into Af-Pak war. 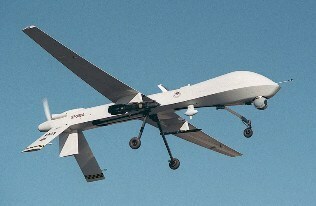 44 US drone have reportedly hits in Pakistan resulting in 700 civilians murders in 2009 alone. 50 out of 60 drone attacks went wrong due to faulty intelligence information, killing hundreds of innocent civilians, including women and children. The number of the Pakistani civilians killed in those 50 attacks stood at 537, in which 385 people lost their lives in 2008 and 152 people were slain in the first 99 days of 2009 (between January 1 and April 8). The attacks which have been killing 97.96% innocent Pakistanis including women and children, depends whether the Punjab dominated army and civil establishment accept them Pakistanis or not, is thing needs to be protested over? Or the capable Pakistan Army “respect” political decisions of US support? What makes the Army Generals the most obedient guys who burst over American’s Kerry Lugar bill is not an old story? What green signal I ask? Has it waited for political orders on Kerry Lugar Bill?